SAGITA COM - ArcSoft PhotoStudio adalah software editor foto yang mudah digunakan dan kuat dengan alat editing foto canggih yang akan membantu Anda untuk mengedit dan meningkatkan kualitas foto digital. PhotoStudio mencakup semua fitur dasar dan canggih seperti Adjust White Balance, Magnetic Lasso, Auto-Exposure, Auto-De-Noise, Scratch Removal, Equalization, Simple Selection, Photo Cloning, Photo Enhancement, Layers, Auto-Red-Eye-Removal, Transform and Crop, Brush and Stamp, Reference Line, Change Bit Depth, Print dan banyak lagi. Standard and advanced photo editing tools. 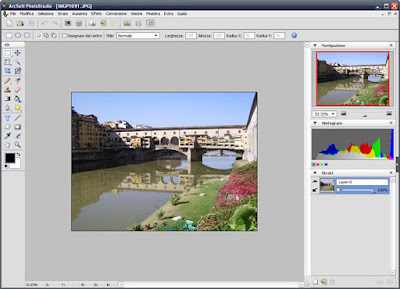 RAW formats, large and 48-bit images supported. Creative photo effects and filters. Detailed photos with brilliant colors. Processes RAW DSLR formats and large image. Face Beautify Plug-in to improve skin, correct. Magnetic Lasso and Magic-Cut tools. Advanced tools, filters, and effects.